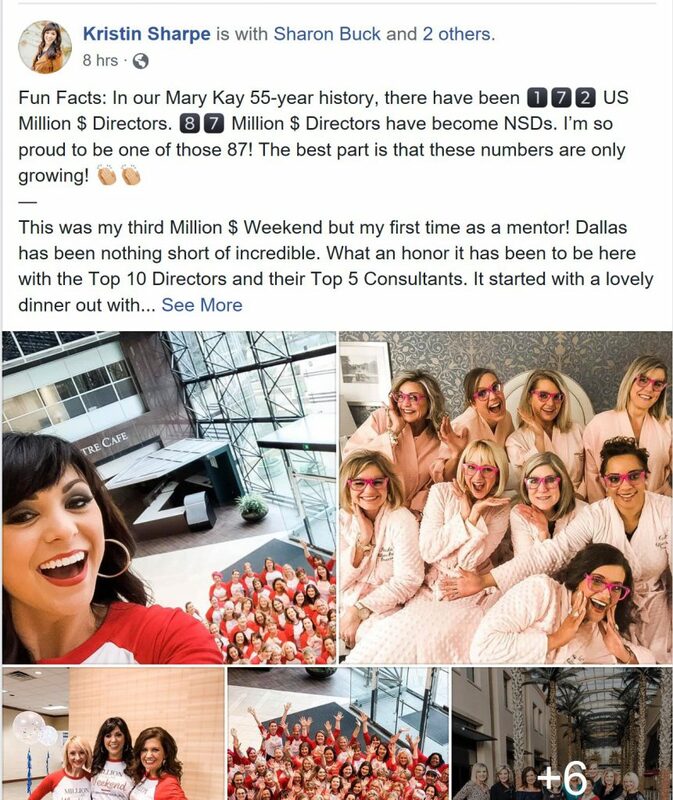 Did you know that it was even possible to fail in Mary Kay if you’re a “Million Dollar Director”? What is a million dollar director? It is a MK sales director whose unit has $1 million in estimated retail production. This represents about $500,000 in products ordered by the unit. (It does NOT represent $1 million sold to customers, although the company would have you believe that it does.) It represents about $100,000 in commission earned during the year by the director. So how can the million dollar director fail? By never making it to NSD. All that “success” and you can’t make it to national sales director, the pinnacle of success in Mary Kay? In 55 years, 172 sales directors have hit the $1 million unit club. 87 of those went on to become NSDs. 85 of those never made it to NSD. That’s essentially half. Half never made it, even though they tell you that YOU decide when to promote yourself. ANYONE can do it. Yeah, “promote yourself”. If you believe this, I have some beach front property in Kansas or a unicorn farm I can sell you. Kathy Helou’s 2 million dollar year was conjured up by the use of 2 months of double credit. And guess what. They don’t PAY you commission on magical double credit. Let’s also not forget how many directors are so desperate to get to the next level of NSD that they are willing to buy their way there and still not achieve the goal. One person that I can think of specifically is sales director Pam Kelly in Colorado Springs. The only director to win all three titles in one Mary Kay year and had floor to ceiling boxes of an opened product in order to achieve the “queen of sales“ goal and now she’s too old to become a national and I often wonder does she look back on all of it and realize what a waste? In 55 years, 172 Directors have achieved $1 million in annual “production” which means they received $100,000 in commissions. That is, assuming none of those production figures included double credit months. In 55 years, individual Directors received $100,000 in commission ONLY 172 times. In 55 years, with well over 100,000 Directors in all those years, only 172 Directors have reached the $100,000 commission level. And very, very few have repeated that dubious achievement. In 55 years… 172… three per year. Isn’t there another MK figure floating around that says MK has more women earning $100,000 than any other company? Don’t you love it when their own lies contradict each other? Not exactly. I had the same thought at first. Remember that there are directors who hit million multiple years, and they’re only counted as *one* in this tally of 172. So, then, more than 172 instances, but only 172 women in 55 years… out of about 100,000 Directors. The odds of any Director getting that magical Executive Income Level are about 2/10 of 1%, before mandatory MK expenses, of course. And those mandatory expenses (all conferences, The Suit, meeting space rent, “topping off” production, chargebacks, executive assistant, more) quickly knock the Executive Income down to lower-middle-class Income. Curiously, the 2/10 of 1% chance of a Director is making good… before expenses… is about the same odds an ordinary consultant has of making any money at all. But I’m sure that’s just a coincidence. And they wonder why they’re not taken seriously. She was SO hoping and pushing to do a Million again last year, I think at one point she was about 250k away and there wasn’t much time left. I kept watching her fb posts to see if she’d admit they wouldn’t make it but nope! Holding on and beelieving until the broke and bitter end. And so, so many that just can never make it to Million. No Plan B for when they don’t make it to NSD by their 65th birthday and have nothing to show for their work. Yeah, I know one of those ‘172’ million dollar directors. Her name is Gina Beekley… she made million once in the early 2000’s… was seriously on target for NSD – but then the wheels fell off the wagon big time. Her up and coming star SD quit… and because Gina’s future area was built quick… there wasn’t a lot of stability. She lost directors left and right… I think she may only be a future executive with at the most 3 offspring. I have no way of knowing how she’s doing now… but I hadn’t seen her in the applause magazines at all for awhile. I just find it so sad that so many women strive for so many years… to realize sometimes much too late.. it’s all a house of cards. So most of these directors claiming they “make a six-figure income” are lying and one quick way to tell is if they have been or are a “Million Dollar Director”? Well…. as you may know, MLM participants have an answer for everything. So when you find a director who is not a Million Dollar Director (and therefore not making commissions of $100k), she’ll tell you that she has income from PRODUCT SALES. So it’s not just commissions. It’s product sales. It’s also the value of all the prizes and trips. They use fancy footwork to make it “true” if you ever invalidate the income claims. I checked on this lady’s Facebook page and she has a couple of pics of her son as her ‘why’ and how she gets to ‘stay-at-home and make an executive income!’ and then about 10,000 posts of her traveling the globe for MK sans kid. Like, huh??? It all just seems so plastic.